Sleeping with pain is no easy feat. You most likely end up tossing and turning most of the night, trying to find a comfortable position. If you suffer from neck and shoulder pain and like to sleep on your back, it’s important to find a good pillow. Here we’ll review the best pillows for back sleepers that have neck and shoulder pain. Why Does My Pillow Matter When It Comes To My Neck And Shoulder Pain? When you are already experiencing pain, you don’t want the way you sleep to further exacerbate the problem. While certain sleep positions already lend themselves to causing more pain, your pillow might actually be the main culprit. An extra plush pillow might feel comfortable initially, but it is going to lead to more aches and pains than comfort in the long run. The longer that you lay on a soft pillow, the more it is going to compress. A flat pillow won’t be able to properly support your head and neck which will lead to tension in your neck and shoulders. If you already have pain in this area, this will just make the problem worse. A pillow that is too thick is also going to cause you neck and shoulder problems. If you use a very thick pillow, this is going to put your neck at a sharp angle rather than keep it in line with your shoulders and spine. Just like a pillow that is too soft, keeping your neck at the wrong angle is going to put more strain on your shoulders and cause pain. If you use an extra thick pillow or double up your pillows, you might be doing more harm than good. What Can A Good Back Pillow Do For My Neck And Shoulders? If you choose the right kind of pillow for your sleep position, you can make sure that your whole upper body has the proper alignment. This is what is going to allow you to sleep without pain and not make a problem even worse. This is going to be the biggest benefit of choosing the right pillow for sleeping on your back. Many pain problems that occur while sleeping are due to the fact that you slept in a weird position. A good back pillow can stop this from happening. The right back pillow will make sure that your neck stays at the right angle, your shoulders aren’t scrunched up and they are elevated properly, and will also keep your head secure as you sleep. Your head is very heavy and it takes more support than you might think to keep it comfortable as you sleep. During the day, your neck and shoulders are supporting the majority of the weight of your head. When you sleep, your pillow takes over that job. If you don’t have a pillow that can offer you the right amount of support, you are going to have pain in your neck and shoulders. Back pillows are made to especially support your head while you are sleeping in that particular position. Support and proper alignment are important to keeping your neck and shoulders free from pain, but comfort also plays a factor. Even the best back pillow isn’t going to help you sleep better if you don’t find it comfortable. That is why you should try and test out a few different pillows before you commit to one. Many pillows that you order online, will allow you to have a trial period before you decide to keep the pillow. This gives you enough time to try the pillow for a few nights and see if it is the right fit for you. If you get your pillow from a store, you can try a variety of pillows before picking the one you want to purchase. Make sure you ask about the return policy before you buy the pillow though because some stores will not let you return the pillow once it has been opened and used. What Material Will Be Best For My Pillow? You have a few different options when it comes to what your pillow is made with and each one offers its own advantages and disadvantages. Memory foam is all the rage when it comes to mattresses and pillows. It is not a new technology, it has been around since the ‘60’s, but there have been new advances in how it’s made. Memory foam is a high-density foam that has the unique ability to be supportive as well as conform to all the contours of your body. There are a few different kinds of memory foam available right now and the type you choose will largely be based on personal preference. 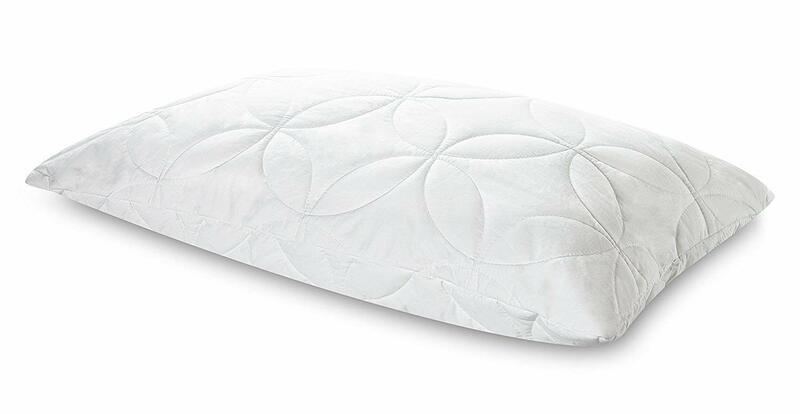 ● Shredded Memory Foam- These kinds of pillows are made with small pieces of memory foam. Shredded memory foam helps with air flow and still acts in the same way as traditional memory foam. ● Gel Foam- This is another attempt to make memory foam cooler and more comfortable. The gel will be inserted into memory foam in the form of little beads or there will be a layer of gel on top of the memory foam. Latex foam will act in the same way as memory foam, but it will spring back a little faster than memory foam. It is also made in a more natural way than memory foam, which can be made with harsh chemicals. Latex foam pillows will also be a little more expensive than memory foam because the process to make these pillows is a little more complex. These are the least expensive option for pillows, but they might not be the best option. They can be a little too soft for back sleepers, especially if you have neck or shoulder pain. There are a few options that can work, just make sure you try them out before you commit to buying them. This pillow is another slim pillow, but it is made with natural latex foam instead of memory foam. It will still conform to your body and provide good support but with a much thinner profile. The latex foam is ventilated with air holes to help keep the pillow cool as you sleep. The latex is hypoallergenic, anti-microbial, mildew resistant, and anti-dustmite so it is great if you suffer from allergies. The pillow comes with a cotton cover and is a medium firmness. Because this pillow is thinner than most, it might be good on top of another pillow to provide proper support and alignment. This pillow is made with shredded memory foam to help make sleeping a little cooler. The shredded memory foam also allows you to adjust the height and thickness of the pillow. If you need a little more support underneath your neck to ease pain, you can adjust the foam to be higher right under your neck. The whole pillow is covered in a 100% bamboo fiber cover that is hypoallergenic and will help cut down on allergy irritations while you sleep. It is also removable so you can easily wash the cover. This pillow comes rolled up for easy transportation, so you will need to let it air out and return to its regular shape for at least 24-hours after you receive it. The CozyCloud pillow is a shredded memory foam pillow that is made right here in the United States. It has been recommended by chiropractors to help ease pain and aches while you sleep. It is ideal for back sleepers, but will also work for any other sleep position which is nice if you move around while you sleep. You can get this pillow in two different sizes, queen and king, so you can pick the right size for you. 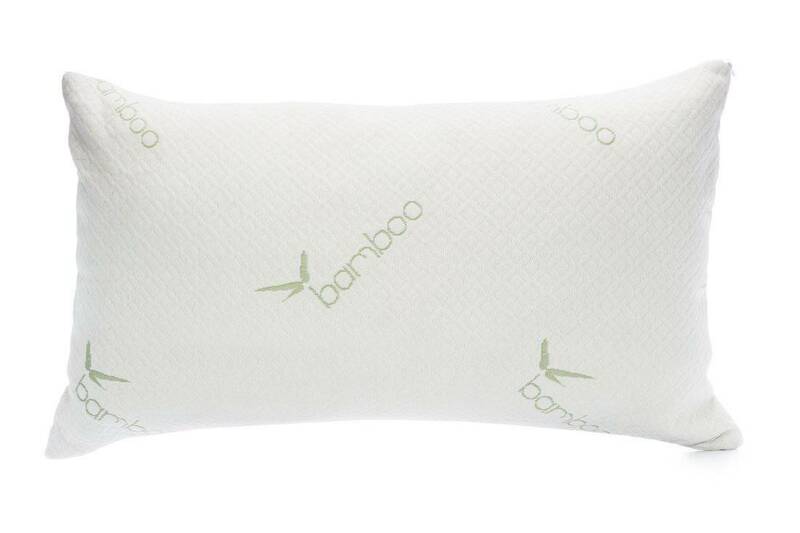 The pillow is covered in a bamboo and polyester blend that can be removed and washed. Everything is hypoallergenic and the memory foam is certified CertiPUR-US. CozyCloud also has a 10-year warranty that covers all parts of the pillow. At first glance, this pillow doesn’t look like it is going to be comfortable at all. But it is made specially to create a supportive and comfortable sleep surface. It is made with non-allergenic and non-toxic foam and comes with a fitted cotton blend cover that can be removed for easy washing. Each part of this pillow is used to help ease pain as you sleep. The concave center gently cradles your head and the wedge extension helps support your neck. 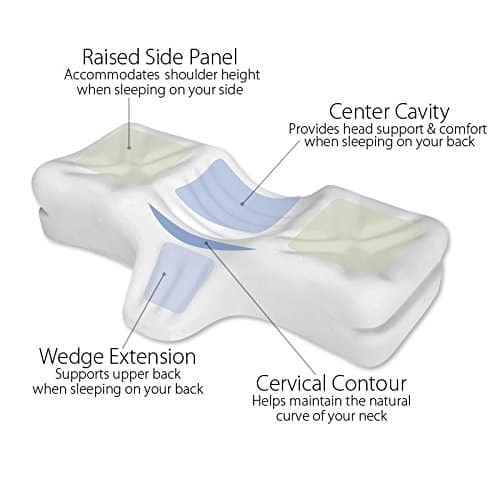 The raised sides help adjust to your shoulder height and the whole pillow keeps your entire spine in alignment. This pillow has a 5-year warranty to not lose its shape or resilience. You can also purchase this pillow in five different sizes including a child size, so that it perfectly fits your body. Tempur-Pedic TEMPUR-Cloud Soft & Conforming Queen Size Pillow is exactly that...comforting. It is soft, comfortable, and does conforms to your neck and head without giving too much. It provides really good support during sleep—Perfect for almost any sleep position. The material was created by NASA and the manufacturer did a great job of ensuring the proper firmness. It is made in the USA so the quality is superior to many imported pillows on the marketing. And these guys stand behind their product with an impressive 5 Year Warranty.